Pizza paratha is a stuffed flatbread which tastes like pizza and popular among kids. It is a fusion between paratha (Indian flatbread) and Italian Pizza. This homemade pizza paratha is hygienic and healthy as compared to market one. This is a very quick and easy pizza paratha recipe and can be made anytime if all the ingredients are available. Pizza paratha is also known as vegetable stuffed cheese paratha or cheese paratha. It is a great delicious snack for kids to fulfill their love for pizza anytime. No chutney or sauce is required to enjoy this lip-smacking pizza paratha. Kids enjoy this delicious paratha and mom feels happy to see them eating veggies and grain happily. So this is a win-win situation. What is a pizza paratha? Basically, it is an Indian paratha (flatbread), which is stuffed with pizza sauce and vegetables filling with cheese. Cooked on the stove top like a paratha, there are many ways to stuff the filling and closing of the paratha. 1. Roll one roti spread the filling on half of the side, and then fold it with another half. Makes a semicircular shape. 2. Rolling one roti, spread the mixture in the middle and fold like lifafa paratha. This way you will get a square paratha. 3. Roll two roti spread the mixture on a roti except on edges and then cover it with another roti. Sealing all the sides with the fork. Which flour to use to make this paratha? 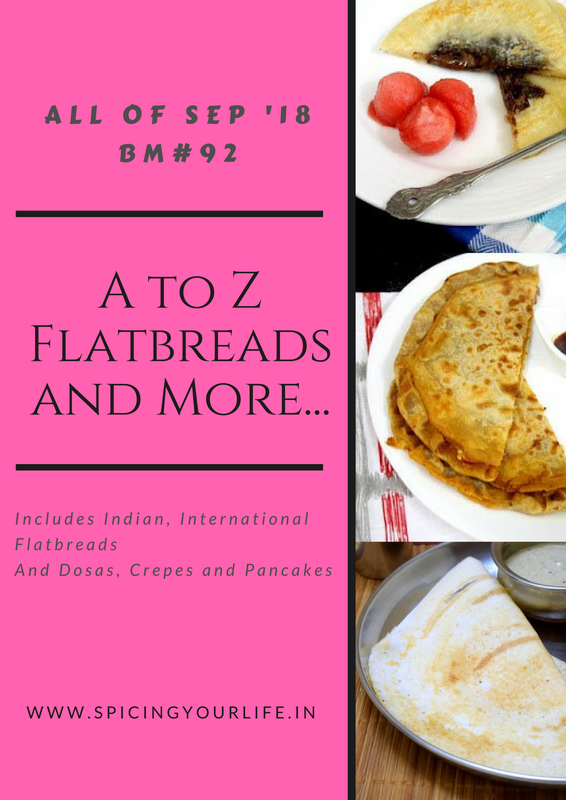 Since it is an Indian flatbread, challenge yourself and use any kind of flour. Add whole wheat flour if using any gluten-free flour. In this recipe, nachni aata which is a finger millet flour is used along with the whole wheat flour. Ragi or finger millet flour is very healthy and loaded with vital nutrients. It is one of the best sources of calcium,fiber-rich and being low in glycemic index good for diabetes. It is also a good source of iron and help in weight loss management. Read here for more. Process To make pizza paratha? To make this nachni pizza paratha, knead the dough as paratha. No need for any fermentation or resting time. Cut any combination of vegetables like bell peppers, sweet corn, mushroom, zucchini, cottage cheese, add seasoning, pizza sauce and lots of cheese. That’s all you need to make this easy pizza paratha. So let see how to make this delicious Nachni Pizza Paratha. In a mixing bowl combine ragi flour, whole wheat flour salt, and oil. make a soft dough using water. Make sure you are careful while adding water. By any chance, if you added extra water just take extra whole wheat flour and then knead to make the dough. Take another bowl to make the filling. Add bell peppers, sweet corn, olives, cheese, red chili flakes, Italian seasoning, pizza sauce, and salt. Give a nice mix. As soon as you make filling use it asap. Due to salt bell peppers starts releasing water. Even after a few minutes, it will be difficult to fill. Now Divide the dough into 4 equal parts. Make smooth balls from each portion. Roll it into a 5-6″ circle. Don’t roll very thin. Make two rotis(flatbreads) of the same size and keep them ready. Spread 5-6 tblsp filling on one of the rolled roti (flatbread).Except on the edges spread all over nicely. Now place another rolled roti over this and seal gently on the edges with the help of a fork. Press slightly don’t press too hard otherwise the dough will break and filling will come out. Press gently so that filling sets in between the two layers. Heat a griddle on medium flame. And once it is hot enough place this rolled paratha on the griddle. Cook on low heat for 1-2 minutes and then flip it on another side. Again take 1-2 minutes to cook paratha before applying oil. Paratha should look golden brown. Apply oil and cook for few seconds from both sides. One paratha should take minimum 5-6 minutes to cook on the griddle on medium heat. Otherwise, it will be raw from inside. Nachni Pizza Paratha or pizza paratha is ready to enjoy. Add red chili flakes as per choice. This quantity does not make this paratha spicy. You can add onion too. I did not add due to the shortage at the time of cooking. Any kind of vegetables will work to fill inside the paratha. For the dough, you can use only refined flour or whole wheat flour and any millet flour. This pizza filling enhances the flavor and so kids eat without a fuss. I find it a great way to feed healthy grains. Chop vegetables very fine, else it will be a difficult task to stuff. By making this into pizza you can make kids have it..very smart twist..and the roti looks so inviting! yeah this nachni pizza paratha rock. Bhawana, this is a perfect recipe for my kids lunch boxes. They love to take quesadilla to school and this looks very similar to that and is made with healthier flour. Thanks Sandhya for liking nachni pizza paratha. Such an innovative recipe and an awesome way to get kids to eat Ragi!! The first click looks sooo inviting and yum! My kids will love this pizza! hahahh Thanks PJ. first click shows temptation with in to bite it quick. Ragi based pizza.. wow great idea to add ragi in meal for kids. Thanks Priti for liking nachni pizza paratha. Wow Bhawana, so so delicious and what an innovative recipe. A good way to incorporate ragi into the kids and fussy adults diet. Bookmarked this recipe. Thanks Mayuri di, I am glad that you loved this nachni pizza paratha. That is a brilliant way to incorporate Ragi into the diet. Bookmarked to try. Wow, awesome fusion paratha and i simply love the addition of ragi flour in the dough.. Such an ultimate way to sneak this nutritious grain in our diet.. Beautifull pizza paratha there. Wow! What an incredible nutritious treat for kids. They won’t even taste the ragi when it has such a delicious filling. Nice pick Bhawana. What a droolicious pizza Paratha ! I am loving this one and the last click with those cheese strings is just out of he world ! That is such a wonderful way to get kids to eat nachni and veggies…lovely pick!! Looks delicious!